Pure chance or cunning bait — I’ll never know, but regardless of how it got there, the item I spotted in a secondhand junk store turned out to be a perfect example of something that used to be known in the antique trade as a ‘naughty*’ piece. Although the store advertised itself as selling ‘antiques’, almost everything inside was simply cheap furniture from the nineteen-fifty’s, a few racks of secondhand clothes, the odd pile of long-playing records, assorted aluminum pots and pans, and a few old copies of Life magazine. But perched on a scratched and stained Danish Modern coffee table with one leg missing, was something that caught my eye — something that looked like the genuine article. On closer inspection I discovered I was looking at what is properly known as a toilet mirror: a small tilting mirror mounted on a small case fitted with one or more drawers. 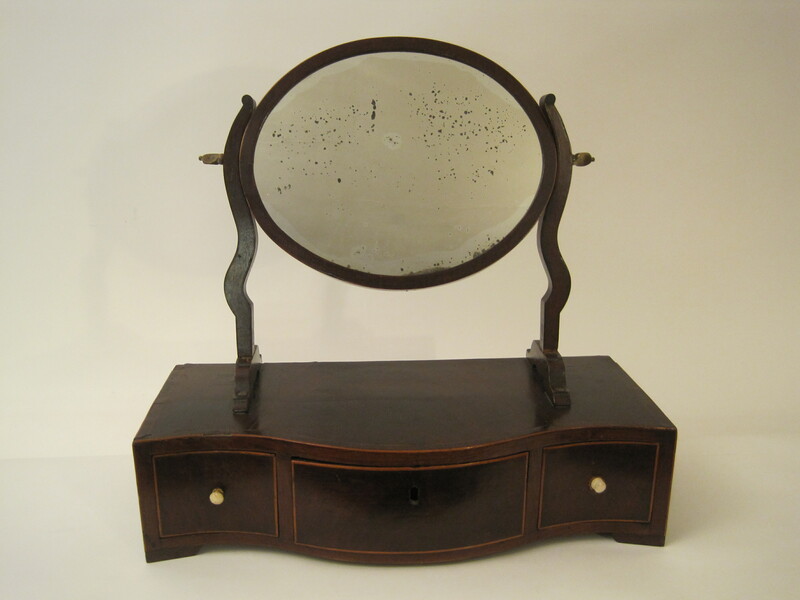 Sometimes also called dressing glasses, but more often referred to not quite accurately as shaving mirrors, a toilet mirror is a small item of furniture that became popular in the eighteenth century. Such items continued to be made well into the nineteenth century when the ability to produce larger size mirrors made them obsolete. Typically veneered with mahogany or walnut they range from plain rectangular boxes with a single drawer to cross-banded and stringed serpentine-fronted cases surmounted by a variety of different shaped mirrors, invariably tiltable. Like larger pieces from the eighteenth and nineteenth centuries, such as bureaux, bookcases, and commodes, they are instantly recognizable as pieces from the golden age of cabinetmaking, and as such are easily classifiable as Queen Anne, Georgian, Chippendale, Sheraton, or Hepplewhite, etc. Anything that old instantly engages my attention, and I was unable to resist picking it up for a closer look. The first thing I noticed was that the mirror, or at least its frame, had to be a subsequent addition, since it was supported on feet screwed to the top of the case between two small veneered patches. These patches were covering the mortises into which the original frame must have been tenoned. Undeterred by this anomaly, since the frame and stops looked equally as old as the case, I opened the drawers, looked underneath, and decided this was indeed the genuine article. The design, the patina, the rosewood crossbanding, the satinwood stringing, and — beneath a certain amount of grime — a spectacular flame walnut veneer all sang out to me. It was at this point that the shop owner appeared. Tucking a grubby t-shirt into dirtier pants, and with a largely toothless grin, he allowed as ‘how rare it was to find a shaving stand with its mirror still intact’. I nodded, and thus encouraged he added that despite the fact that some of the stringing needed regluing it was a rare find. I looked at the mirror which was in fact intact. A scattering of dark spots where the silvering was missing did little to obscure the wavy look of really old glass. Affecting only a mild interest I asked the price, and was given a figure that was surely higher than for anything else in the shop. But, realizing that even at a knowledgeable dealer’s auction this price would have been a bargain, I tried not to show my enthusiasm, shrugged, and asked if it were possible to do a little better. The grin disappeared, he grumbled and repeated how rare it was to find such a piece with its original glass — but dropped the price. I bought it, and scarcely believing my luck took it back to my workshop, proud and excited to have found another piece of eighteenth-century furniture. For the next few hours I carefully reglued loose sections of stringing and banding, and gently eased a couple of veneer bubbles back into place with a scraper that I had heated in hot water and then, protected by several sheets of blotting paper, pressed over the parts that had become separated. With some 0000 wire wool and a little beeswax I removed some small paint spatters, being careful not to remove too much of the two-hundred year old patina. By the time I had finished I had made some startling discoveries. My toilet mirror, although undoubtedly old, was not exactly what I had initially thought it was. 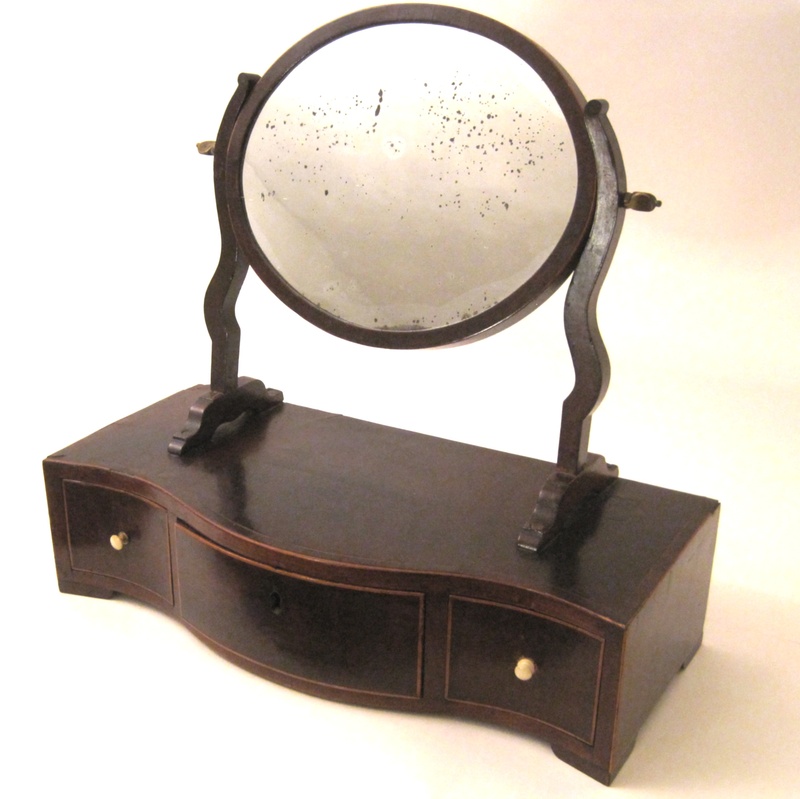 The mirror’s oval frame, although veneered with cross-grain dark walnut and edged with satinwood stringing, and holding genuinely early thin glass — which I ascertained by placing the edge of a quarter on the surface and tilting it slightly in order to measure the distance between the edge of the coin and the beginning of its reflection — was definitely not eighteenth-century but more probably early Victorian, since the turnscrews holding the mirror’s frame in its supporting structure were finished in points rather than the flat domes found on eighteenth-century turnscrews. Not only that, but the supports that held the frame were also made of mahogany in contrast to the walnut veneer of the case — with feet of a lighter wood that had been stained to match — visible where a small scratch had cut through the stain. The case was quite different. Veneered in flame-pattern walnut, with rosewood crossbanding and satinwood stringing around all edges, it had a serpentine front containing three drawers. It was a perfect compliment to several Sheraton bureaux I have pictures of, and I was reminded of the fact that these items were often kept on top of stylistically similar larger pieces. But the drawer handles were wrong. Instead of Sheraton-style drops, the two outside drawers had small ivory pulls. Although beautifully turned I could now see they were not original; not only did they not sit perfectly against the front of the drawers but there were also signs of missing finish where other knobs or pulls must once have been attached. The wide central drawer — where the original owner probably kept valuable toiletry items such as expensive brushes and combs — had originally been fitted with a lock. The lock was missing, and so was the standard round-bottomed escutcheon that must have once protected the veneered surface from the key. More obvious was the fact that the drawer did not close flush with the front surface of the case. I pulled it out for closer inspection. Beautifully dovetailed thin oak sides and back with perfectly parallel saw marks still visible, plus a tapered piece of walnut veneer at the very front of the drawer bottom (to keep the drawer centered vertically when closed) formed a solidly rectangular whole — and yet while not warped or out of shape in the slightest degree, one side of the drawer remained almost a 1/4in. proud of the front of the case. The reason became obvious when I looked inside the case. New drawer stops had been clumsily glued to what I could now see was a replacement back. The outside of the back piece had not initially attracted my attention since it was more or less uniformly dark as if oxidized by age, but the inside was much lighter and clearly a relatively new piece of pine! My final discovery came on turning the case upside down. Although I could see the bottom was original — there was the scribeline outlining the dovetails where the sides joined the bottom, and there were the small dark areas of more oxidization where tiny nails went through the bottom into the drawer partitions — the feet were crude replacements. Although they had been stained to match perfectly the colour of the rest of the case, they were little more than crude pieces nailed on, not even perfectly aligned with the sides of the case and mismatched in terms of height to boot — causing the case to rock slightly when placed on a flat surface. The original feet — which would at least have been nicely formed little brackets, if not a more complicated design in keeping with the sophistication of the rest of the elegant case — had been sawn off, as evidenced by saw marks on the corners of the bottom. My toilet mirror consisted of mis-matched parts, crude replacements, and missing elements — all adding up to a ‘naughty’ piece designed to masquerade as a genuine fully integral eighteenth-century antique. Such salvage operations have been common since Victorian times as the supply of genuine pieces dried up and unscrupulous dealers have sought to satisfy modern demand. It has been estimated that out of a total population of twelve and a half million in eighteenth century England no more than two million families might have been able to afford high-quality cabinet pieces, and of these probably no more than a hundred and forty thousand might have had the need to do so, and yet there may be as many as two thousand pieces offered for sale every year now in antique shops and auctions — in addition to those already in museums and other authenticated collections. Obviously they can’t all be genuine. I’ll never know if my attention had been drawn to the ‘rare original’ mirror in order to distract me from other disparate elements, but I now knew I was not the owner of a ‘genuine eighteenth-century shaving stand’! On the other hand, most of it is still very old and beautifully made, and gives me a lot of pleasure to look at and consider its long and colourful past, and wonder whose possessions it must once have held and whose reflections it once showed.